Individual memberships are all available at $25 per person, per year. The memberships provide operating funds to administer community grant requests and scholarship awards and to grow the many funds within the Foundation. In addition, members are asked to vote for the selection of Trustees and to help serve on Foundation issues and community committees. As always, your memberships are used to promote and improve the quality of life of Monroe citizens by providing monetary support for grants for Monroe students and community groups. The Foundation also has several funds to which you can contribute, including but not limited to, our scholarship and endowment funds. The Monroe Area Community Foundation is a nonprofit, 501 (c) 3 charitable organization to seek and receive donations; invest for growth; to make charitable and civic contributions to enhance the welfare of individuals or groups in the Monroe area. Contact Monroe Jr/Sr High School Counseling Office for applications and criteria for these scholarships at (513)539-8473. Each year the Monroe Area Community Foundation presents several scholarships to qualifying graduating seniors at Monroe Local Schools. The MACF does so by utilizing trusts, memorial gifts and designated contributions to build individual funds to make the monies available. Available Scholarships for Monroe Seniors: Deadline for filing Monroe Area Community Foundation (MACF) applications is 3:00 p.m. on March 15 of each year. James A. Macready, M. D. Memorial Scholarship. $1,000 scholarship for a graduating senior at Monroe Local High School enrolled in a four-year college or university with a major that qualifies the student to enter the field of allopathic medicine. A grade point average for grades 9-12 that is acceptable for enrollment in an accredited school, college, or university pursuing study in the medical field at college level is also required. A teaching field of study applicant may be considered if no medical application is received. Richard L. Miltenberger Memorial Scholarship. $500 scholarship for a graduating senior at Monroe Local High School who has lettered in a sport at Monroe High School and enrolls and plans to pursue studies in fine arts, whether it be graphic arts, design, animation, art education or similar studies including the use of computers in the field of art. James M. Anderson, M. D. and Bertha Anderson Family Scholarship. $1000 scholarship to be given for a graduating senior at Monroe Local High School enrolled in a four-year college or university with a major that qualifies the student to enter the field of allopathic medicine. All applicants must be students in good standing with a grade point average for grades 9-12 that is acceptable for enrollment in an accredited school, college or university pursuing study in the medical field at a college level. Walter L. Bake Memorial Scholarship Fund. $500 scholarship to a graduating student at Monroe High School enrolling in a community college or four-year college with a major of the recipient's choice. Lee Ann Miltenberger Memorial Scholarship Award Fund. Three (3) Two Hundred Dollar ($200) scholarships or awards for three Monroe seniors for outstanding achievement in study of photography, drama (production) and music (vocal). These subjects were not only Lee Ann's favorites, but also proved to be very helpful in her job experiences and enjoyment throughout her lifetime. Monte R. Miltenberger Memorial Scholarship Fund. $250 scholarship to a Monroe Local High School graduating senior who is continuing education in a field of study at a technical or vocational school. Nancy Cahill G.I.G.G.L.E.S. Memorial Scholarship Fund. This scholarship is available to graduating students from Monroe Local Schools who have shown a great interest in the community. It is intended for, but not limited to, persons aspiring to attend any post-secondary degree or certificate program. This scholarship is awarded to usually three or four eligible students in amounts from $250 to $750. The Janine Westercamp Memorial Scholarship Fund. This $250 scholarship is available to graduating students from Monroe Local Schools who are pursuing study in family or social service or education. The Todd Miltenberger Memorial Scholarship Fund. This $250 scholarship is available to graduating seniors from Monroe Local Schools who are pursuing a major of his or her choice at an accredited college or university. The applicants must have displayed outstanding leadership qualities and also participated in a varsity sport while giving loyal service to the Monroe community and Monroe Local Schools. James A. Macready, M.D. Memorial Scholarship of $1,000 for recipients since the inception of this scholarship. Marking the 60th reunion of the LMHS class of 1942, a one-time scholarship of $1000 was awarded by the Lemon-Monroe High School Class of 1942 to Lydia Manley at the 2002 Awards Assembly. The deadlines for grant requests from MACF are: March 15, June 15, September 15, and December 15 of each year. Contact Jamie Pierce at 513-539-9914 for a grant request guideline. These are reviewed quarterly by the Distribution Committee. If acceptable, grants can be awarded with the approval of the MACF Board of Trustees. Applications do not carry over to the next quarter. A new request must be made. - $250 to Miami University Middletown for construction of dugouts and fencing at the ball diamond next to the former Monroe High School building. - $250 to Monroe United Methodist Church Upward Basketball Program to purchase a basketball hoop. - $500 to Monroe Lending Library to cover the cost for the advancement of the DVD Media Section. - $400 to Monroe J. High for Eighth Grade Language Arts book project. - $244 to Early Edge Learning Center to purchase a Fun ball basketball hoop with multiple hoops for their playground. - $331 to Monroe Elementary, Monroe Local Schools, to purchase sensory items for Special Education Department. - $300 to Summer Youth Theater for repair and upgrading sound equipment. - $350 to Monroe Local Schools Elementary Saturday Safari Program to hire a Magician for a Saturday event. - $400 to Monroe Lending Library for purchase of "Best Sellers" requested by Library patrons. - $300 to Village Ringers of Mount Pleasant to purchase twenty choir chimes to enhance Music Therapy program for residents with Alzheimer. - $500 to Hornet Haven for purchase of playground fence to satisfy City of Monroe Life/Safety Code. - $500 to K-12 Monroe Local School to purchase 26 new books for the Library-Media Center. - $500 to Citizens Against Domestic Violence for installation of a second telephone line. - $283.98 to Monroe Swim Club for portable steps with handrails to provide better access into the swimming pool. - $500 to Senior Independence Adult Day Services for new carpeting at their Mt. Pleasant facility. - $250 to Monroe Jr./Sr. High School for Student Incentive Programs rewarding Academies, Behavior, and Citizenship. - $250 to American Red Cross for Aid to area families displaced by flooding in Monroe's southwestern district. - $250 to Monroe Elementary School to fund Garden Study Projects around the Classroom Modular Units. - $250 to Monroe Jr./Sr. High School Choir for purchase of Wall Mirrors in rehearsal room. - $250 to Monroe Jr./Sr. Show Choir for purchase of "Stylish Uniforms" used in their performances. - Administered Fundraising for Monroe Fire Department to purchase a Thermal Imaging Camera. - $300 to Mount Pleasant Retirement Village to purchase an Autoharp. - $250 to Monroe United Methodist Church for Upward Basketball Program to purchase a basketball hoop. - $500 to City of Monroe for a movie in Monroe Community Park the evening of June 18, 2010. - $2500 to Monroe Local Schools for pledge to match funds for new band uniforms. - $1536 to Monroe Historical Society for installation of shelving in the corner building "General Store" display. - $400 to Village Ringers of Mt. Pleasant for purchase of wheeled carrying cases for hand bells. - $300 to Citizens Against Domestic Violence for purchase of lollipops to promote "I Am Special" program. - $495 to Village Ringers of Mount Pleasant for purchase of 20 choir chimes to enhance Music Therapy program for patients with Alzheimer. - $750 to Hornet Haven for "latchkey program" at Monroe United Methodist Church serving Monroe youth. - $750 to Monroe Historical Society for charges to develop photographs for display from antique glass plate negatives. - $500 to Middletown Area Neediest Youth for purchase of clothing for needy students in the Monroe area. - $1000 to Senior Independence Adult Day Services for purchase of new carpeting at their Mount Pleasant facility. The Monroe Area Community Foundation held its Eleventh Annual Trustees Meeting on April 24, 2008, in the James Monroe Community Room at the Monroe city building. David Miltenberger, Trustee/Secretary, led the audience in the Pledge of Allegiance. The Master of Ceremonies was Trustee and Assistant Treasurer Elbert R. Tannreuther, who introduced officers and trustees and recognized honored guests T. Duane Gordon and Elizabeth Lolli. Mr. Gordon is Middletown Community Foundation's executive director. Ms. Lolli is the superintendent of Monroe Local Schools. Boyd A. Smith, Trustee/Vice-President, called the trustees' meeting to order. The MACF annual report, prepared by David Miltenberger and Gloria Miltenberger, Trustee/Office Manager, was distributed to members, along with a copy of the treasurer's report. Filling in for an absent Peggy McClusky, Executive Director Ron Tubbs reported on requests and recommendations for grant distributions, which are submitted quarterly. Along with herself, Gloria also notified members that Boyd Smith and Ernest Howard were elected for three-year terms to the Board of Trustees. The trustees were also pleased to announce that Jane Majors has volunteered to complete the term of our beloved and sorely missed Paul Steigerwald who passed away in December 2007. During the business meeting, the Trustees approved the recommendation of the Distribution Committee for a grant awarded for the first quarter of 2008. The grant was to pay one-half of the expense for playground equipment to be placed at the Early Edge Preschool off of East Avenue in Monroe. Mr. Tubbs reported the preschool was first able to raise one-half of the amounts. Then the MACF awarded the balance of $244 from our Endowment Fund so that this equipment could be obtained and available to all children in Monroe. The program was presented by William Brock, Monroe's City Manager, who reviewed accomplishments of the City and enlightened the members on future developments. Another guest speaker was David Irwin, a Monroe junior high student, who gave an outstanding speech, "Why Me? Why Not?" His speech won the Optimist International Regional Contest, which qualifies him to compete in its State Contest. He went on to place second in the State Contest. David is the son of Arni and Mike Irwin, who is a member of the Monroe Local Schools Board of Education. Each year the Monroe Area Community Foundation gives the Cornerstone Award to a person who displays an unselfish use of time or money-for no personal gain-for the betterment of the Monroe community. The winner is selected by the Cornerstone Award committee, who reviews all the nominations submitted from the citizens of Monroe. This year's award recognizing service to the community was presented to Phyllis Sells by Tim Williams for all her hard work and dedication in answering a need for the Monroe community. Phyllis is president of the board of the Monroe Lending Library and volunteered many hours in working to get the library established. A plaque was presented to Mrs. Sells, as well as a permanent plate with her name inscribed, to be applied to the large plaque that hangs in the James Monroe Community Room at the Monroe City Building. The large garden basket of plants and flowers that adorned the refreshment table was also presented to Mrs. Sells honoring her for all her hard work and dedication. This fee helps meet day-to-day operating expenses such as office supplies, printing, and mailing various communications and documents. In addition, members are asked to vote for the selection of Trustees and to help serve on Foundation issues and community committees. As always, your memberships are used to promote and improve the quality of life of Monroe citizens by providing monetary support for grants for Monroe students and community groups. The Foundation also has several funds to which you can contribute, including but not limited to, our scholarship and endowment funds. For more information, call Ron Tubbs at 513-320-3674. Each year the Monroe Area Community Foundation presents the Cornerstone Award to a person who displays an unselfish use of time or money-for no personal gain-for the betterment of the Monroe community. 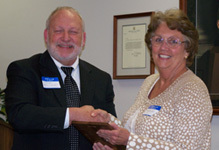 This year's award recognizing service to the community was presented to Phyllis Sells by Tim Williams at the MAFC's eleventh annual meeting on April 24, 2008. Mrs. Sells was instrumental in working to establish the lending library in Monroe. President of the board of the Monroe Lending Library, Phyllis Sells was selected by the Cornerstone Award committee, who reviews all the nominations submitted from the citizens of Monroe. Previously employed as a librarian at Butler Tech (formerly Butler County Joint Vocational School), her expertise in library skills was vital to the project. The lending library is located at 231 Macready Avenue in a modular behind Monroe Primary School It is operated strictly on a volunteer basis. Anyone interested in volunteering or in more information in general can contact Mrs. Sells at monroelendinglibrary@yahoo.com. To enter its online public access catalog or find out about upcoming events (both children and adult), go to www.monroelibrary.net. Forms for Cornerstone Award Nominations are found at the end of this document. Managed fund raiser for purchase of a Thermal Imaging Camera for the Monroe Fire Department. The Foundation extends a big "THANK YOU" to all the contributors to the MACF through membership or a fund donation. The MACF has various funds in which to donate. These funds are the Endowment Fund, James M. Anderson M.D. and Bertha Anderson Family Scholarship Fund, G.I.G.G.L.E.S. (Nancy Cahill Scholarship Fund), James A. MacCready, M.D. Memorial Scholarship Fund, Maitland Donor Designated Advised Fund, Lee Ann Miltenberger Memorial Scholarship Fund, Richard L. Miltenberger Memorial Scholarship Fund, Monroe Historical Society, Monroe Library Fund and the Monte Richard Miltenberger Memorial Scholarship Fund, the Janine Westercamp Memorial Scholarship Fund and the Monroe United Methodist Church Garden Fund. The Cinergy (new Duke Energy) Outreach Program several years ago gave $1000 towards park equipment for the Whispering Oaks playground; and after the Whispering Oaks Swim Club disbanded, it donated the balance in its treasury to the Monroe Park Fund under the MACF. The City of Monroe has been maintaining that area, filling in the pool and beginning a plan to bring more equipment to the park for the residents. In May 2006 Tim Abbott, Business Relations Manager for Duke Energy along with Luis Amaya, Duke Energy's Customer Projects Supervisor, Monroe City Manager Bill Brock, MACF Trustees, David Miltenberger and Paul Steigerwald joined Becky Rutledge and several Whispering Oaks children to celebrate and show appreciation for the newly installed playground equipment at their park provided by the above contributions to the Monroe Park Fund. Unrestricted Funds, Field of Interest Funds, Designated Funds, Donor Advised Funds, Scholarship Funds, and Organization Endowment Funds. Individual memberships are all available at $25 per person, per year. The memberships provide operating funds for the MACF. WHAT ASSETS CAN YOU GIVE TO CREATE A FUND? Cash, Securities, Real Estate, Bequests, Charitable Residue Scholarship or Memorial Fund, Corporate Giving, Give Part of Foundation Income, Charitable Lead Trust and other possibilities. The MACF Membership forms are found at the bottom of this document. Donations can be mailed to MACF, P.O. Box 56, Monroe, OH 45050-0056. Put your signed check and membership form in a stamped envelope and mail it to MACF, PO Box 56, Monroe, OH Thank you for your support! If you have any questions regarding the Monroe Area Community Foundation or want to include us in your Estate Planning, please Contact Gina Miltenberger at 513-262-7861. Do you know someone-a person or persons, or a group of people-who displays an unselfish use of time or money for no personal gain for the betterment of the Monroe Community? Do they meet these guidelines? They have shown generosity of time and spirit. They may have taken on a specific community need. They may have a long history of quiet volunteerism. They may have shown particular courage or determination on behalf of the community. Nominate that "someone" for the MACF Cornerstone Award. List the reasons for your nomination using the criteria and guidelines above. Use an additional sheet of paper if you need it. MACF must receive your nomination by March 15. Our address is MACF, PO Box 56, Monroe, OH, 45050. The MACF Cornerstone Award winner is to be announced at the MACF Annual Meeting in April.